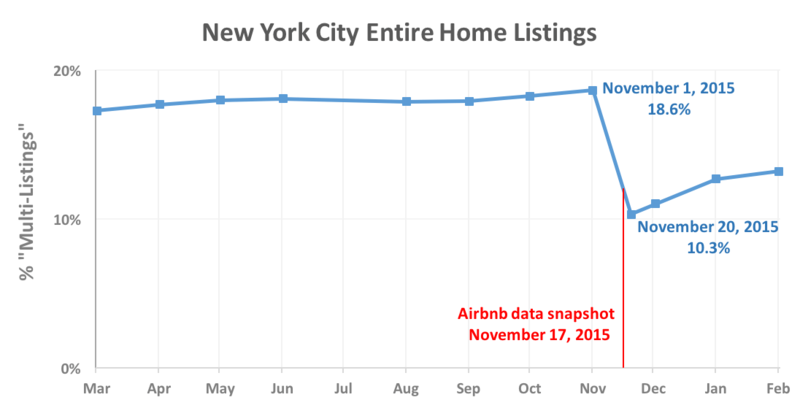 On December 1 2015, Airbnb made data available about its business in New York City, with much fanfare. A new report by Murray Cox and me shows that the Airbnb data release misled the media and the public. Airbnb’s data release was presented as “the first time Airbnb has voluntarily shared city data on a wide scale on how its hosts use the online platform”. This report shows that the data was photoshopped: Airbnb ensured it would paint a flattering picture by carrying out a one-time targeted purge of over 1,000 listings in the first three weeks of November. The company then presented November 17 as a typical day in the company’s operations and mis-represented the one-time purge as a historical trend. Airbnb purged over 1,000 “Entire Home” listings from its site just days before it prepared a data snapshot of its business. Airbnb’s message was that only 10% of Entire Homes listings belonged to hosts with multiple listings. The true number had been close to 19% for all of 2015. Airbnb’s message was that “95% of our entire home hosts share only one listing”. The claim was true for less than two weeks of the year. Airbnb’s rosy projections about the future of its business were not objective analyses based on historical trends. The company extrapolated from an artificial and unrepresentative one-time event. Despite claiming that it wants to “work with cities”, Airbnb carried out its purge without disclosure or consultation. Airbnb did not kick illegal hosts off the site; many commercial hosts still have listings on the site, but the purge made them appear, briefly, to be single-listing hosts. Download the full report: how-airbnbs-data-hid-the-facts-in-new-york-city.pdf. Download the full TS data set as a set of CSV files: 2014, 2015, 2016. Download the full MC data set from Inside Airbnb.